Man has been searching for the meaning of life even from before the birth of Christ. Various religious or spiritual disciplines have developed over the centuries. But inevitably the solution was to escape from life towards a nirvana or a heaven that gave peace and salvation but left this earth unchanged. The Mother and Sri Aurobindo had a contrary view however, formulated upon their experiences and realizations. There is more to life than to escape from it. Even though they recognized the value of other's transcendental experiences, they believed them to be incomplete. Meanwhile, the more materialistic planetary dwellers immersed in life's pleasures inevitably reach a dead-end street. Where was the fulfillment. Although there is a truth here too in the joy of earthly existence. the result has been incomplete. There were two half-truths, two ends of the spectrum. The Mother's pursuit was to harmonize these two extremes leading ultimately to an integrated, holistic person. At the foundation of this next step in evolution is a purified mental, vital and physical being centered around the soul and dynamized by the Divine will. 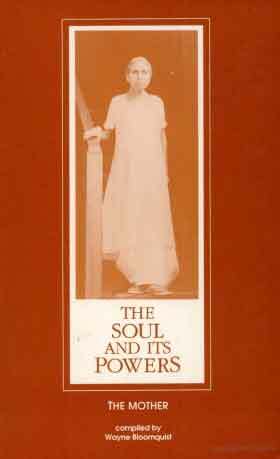 The Soul and its Powers gives a practical and realistic guide to these essential ingredients that make up all of us.